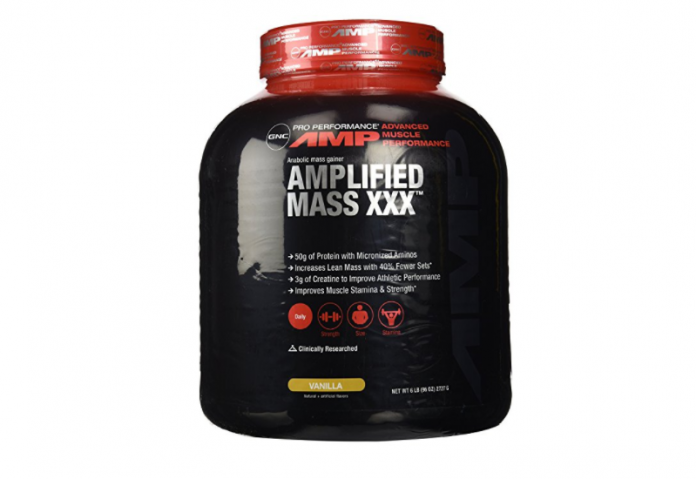 With somewhat fewer options as some of the other gainers on the list GNC’s The Pro Performance AMP gives you all the basics you will need in your battle to gain lean muscle. It uses both whey protein and soy for protein source variety and comes in a tasty vanilla flavor. The combination of whey and soy is a good balance between proteins that get absorbed into your body quickly and those that don’t for a double whammy of protein. This of it as have in a sudden boost and a time release to give you steady protein to fuel muscle growth. The calorie count is lower than some of the other gainers we have seen so far so you need not worry about overshooting your goals, as can happen before you become familiar with the rate your body burns calories. The aforementioned contains all the basics you need to start gaining weight today. This is a great gainer for weight lifters that are just beginning a regular body building routine. If you are not so sure about whether or not you will need an addition two-thousand calories every day alongside your healthy diet then this gainer might be a good place to start. The combination of protein and carbs will give your body what you need in order to gain weight and turn it into lean muscle. The two types of proteins selected for this gainer work very well together, as one can break down in the body very quickly while the other take more time. Basically, this means that if you take this right after your workout your body will be fueled on high proteins for several hours, which is ideal for fast recovery of your muscles. There are only a few, non-deal breaking drawbacks to choosing this weight gainer, as opposed to others on the list. Chiefly, the first disadvantage is the limited ingredients. Though the two proteins chosen for this formula work well together in keeping protein in your body for long periods of time, you are missing out on what other proteins may have to offer, and there are less fatty proteins than soy that could be used for leaner muscle growth. There are also many allergies and sensitivities that go with using soy, and since there are less fatty proteins with a lower allergy propensity this seems like and oversight. Though I would reiterate the intended purpose of using these specific proteins together is to prolong the amount of protein in your system, not to be hypoallergenic. And lastly, as we have seen before with a few gainers, this one is a little low on calories, which is good for a beginner who might not have a high-calorie need as a professional bodybuilder might, it will be less effective on those with an aggressive workout regimen or a high metabolism.